Hello, I am Christina Wood and I am a senior biology major! I am super excited to take Bio 179 because after graduation I am going to be working in a lab researching cancer genomics. I know many family members and friends who have battled various forms of cancer, and I look forward to better understanding the disease so that I can make a difference in what a positive cancer diagnosis means to an individual's quality of life. 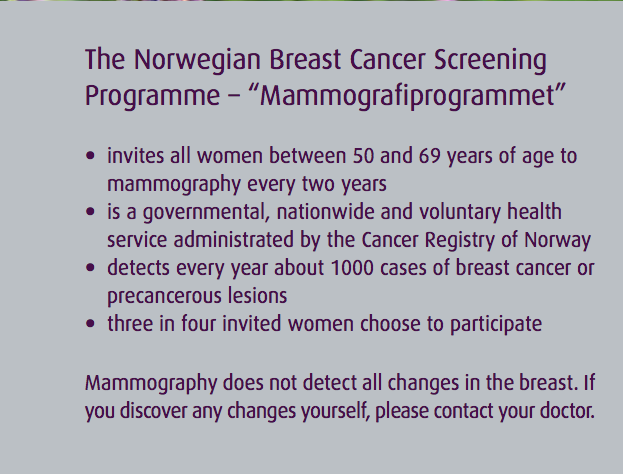 Last quarter I was introduced to the following program; this is a link to the informational pamphlet given to participants of a very interesting Breast Cancer Data Set being collected in Norway. All women between the ages of 50 and 69 are given free mammograms every two years. The overall goal in this is to detect breast cancer early and gather information pertaining to the onset of breast cancer. This is a huge data set that continues to this day!